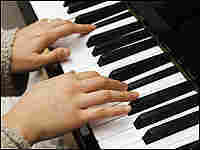 California Scientists Search for Perfect Pitch A good ear is ideal, but perfect pitch? A California study has found that some people can effortlessly identify a musical note simply by hearing it, in the same way that many of us detect primary colors. California scientists searched the Internet for people with absolute, or perfect pitch — those that can instantly identify any musical note. Scientists in California have been studying a group of people with a remarkable musical talent. It's called absolute pitch, also known as perfect pitch. People with absolute pitch can instantly identify any musical note. The California researchers have been identifying people with this skill in order to understand its genetic basis. 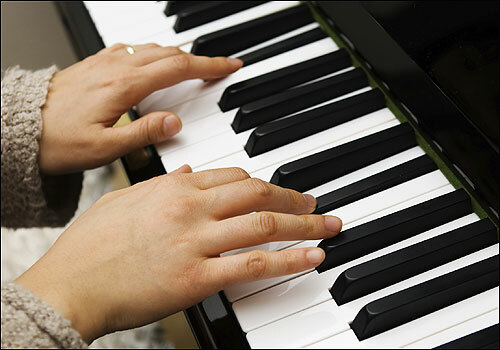 Most people can identify a note on a piano, but there will be some people who hear a note, and without even thinking about it, they will know that it was A above middle C — at least if the piano is properly tuned. Dennis Drayna is a geneticist at the National Institute on Deafness and Other Communication Disorders. He says people with absolute pitch can identify notes on a piano the same way most of us can identify colors. "And we can always identify red and it's obvious what's pink, and we usually don't confuse the two," Drayna says. "People with absolute pitch have an analogous ability for their ear." To find people with this talent, geneticist Jane Gitschier turned to the Internet. She and her colleagues at the University of California, San Francisco created a Web page where people could test their pitch abilities. "People are given an auditory frequency," Gitschier explains. "And then they have to click on a little keyboard to tell us what note they think it is." As she reports in this week's Proceedings of the National Academy of Science, 2,213 people took her test. "We had two different populations of people," Gitschier says. "We had people who score phenomenally well, and people who were throwing darts at the problem." In other words, they were guessing. But even the people who demonstrated absolute pitch did make a few mistakes. When Gitschier analyzed those mistakes, they found something surprising. "The note they err on the most often is G sharp," Gitschier says. Why G sharp? Gitschier has a hypothesis. When an orchestra tunes before a concert, everyone tunes to a single note — A. But A can actually be different frequencies. In the United States, A is typically 440 vibrations per second, or 440 hertz. And there's a range. According to Gitschier, the Berlin Philharmonic tunes to an A at 446 hertz. And some orchestras specializing in early music tune to an A as low as 415 hertz. And 415 is right where G-sharp would be if you tune to one of the higher pitched A's. "So perhaps, people with absolute pitch have learned or incorporated this spread of tuning frequencies into this cluster that they call 'A'," Gitschier says. Knowing more about people with absolute pitch will be essential to finding the genes involved in this skill. Gitschier has already begun collecting DNA from her subjects recruited on the Internet. There's one other curious thing Gitschier uncovered in her study. "Our results clearly show that as people get older, they are perceiving things sharper than when they are younger," Gitschier says. So a C sounds like a C sharp. It's nice to know something gets sharper as we age.